Difference between revisions of "STEM Loggers"
| Logs simulation data to a flat file using a configurable delimeter (such as a comma).&nbsp; Useful for recording raw results of a STEM simulation for analysis. * Headless loggers can be used when STEM is running in headless mode. 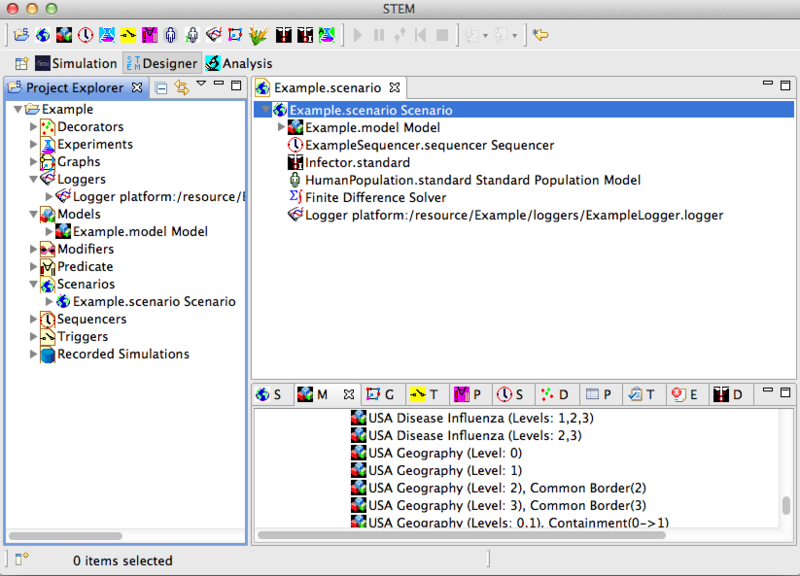 A new feature of STEM Loggers is to ability to select specific disease/population model compartments to record. 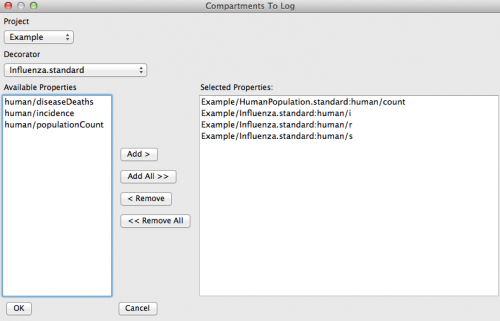 Limiting the logged compartments helps prevent large amounts of potentially irrelevant data being logged, reducing storage costs and increasing performance in disease models that have a large number of compartment (such as Dengue). 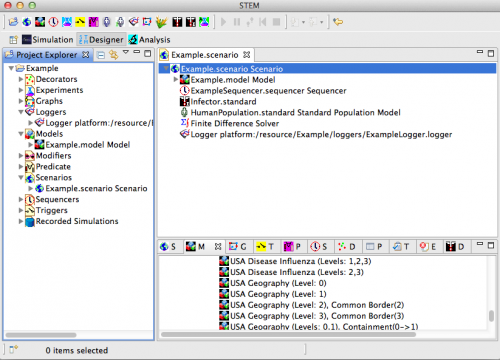 You need to create at least one disease or population decorator in your STEM workspace before creating a logger that logs compartments. 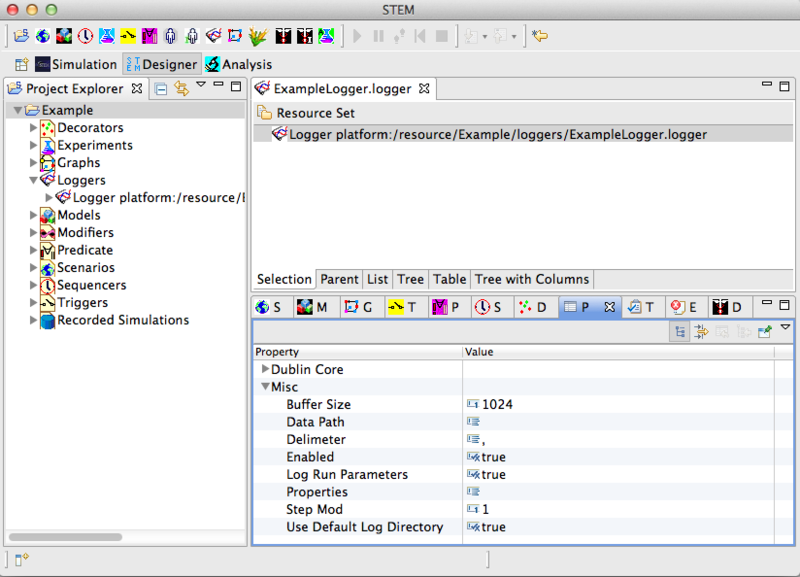 Creating a STEM Logger is similar to creating STEM Models, Scenarios, Decorators, etc. The New Logger wizard guides you through the steps. 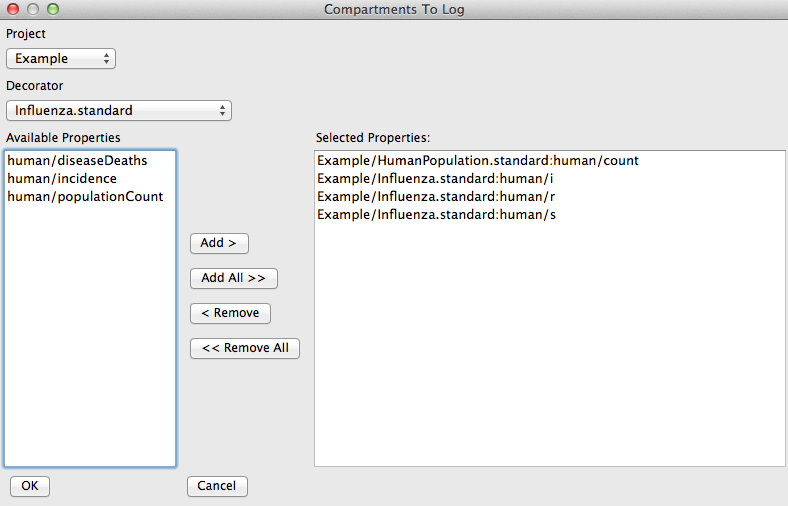 In the Available Properties, select the compartments you wish to log and click Add. This places them in the Select properties list. 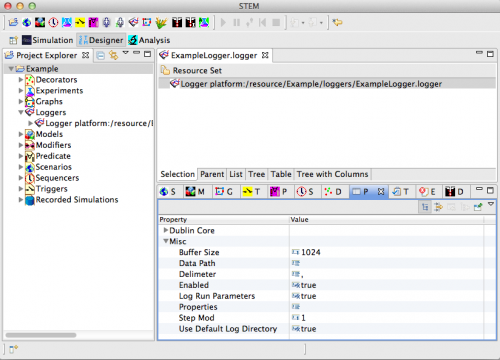 STEM Loggers are configurable on a per-logger basis and contain various settings for each logger type. 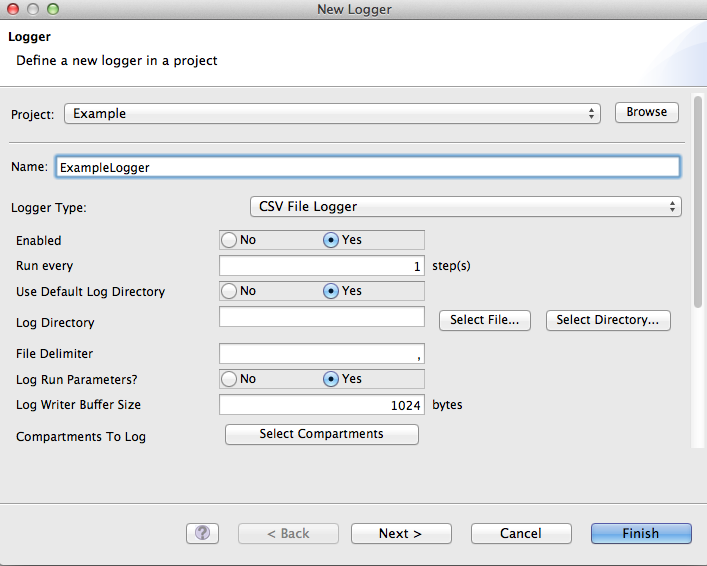 Enabled Boolean Whether the logger is enabled when a simulation starts. 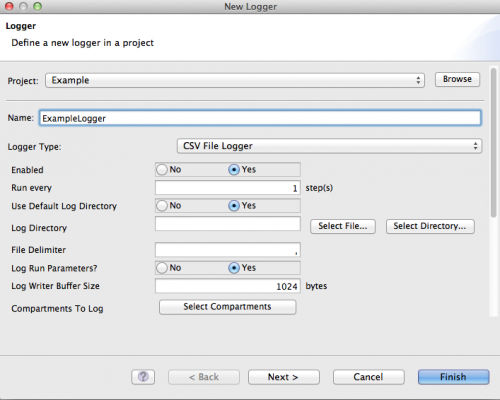 Default is "Yes"
Use Default Log Directory Boolean Whether to use the Default Logger Directory (Project/RecordedSimulations folder). Default is "Yes". Log Directory String/Path Required if Use Default Log Directory is no . Useful if you want to log to an external device. Run Every n Steps Integer Triggers the logger only every n simulation cycles/steps. A value of 1 runs every step. 2 would run on steps 0, 2, 4, etc. Default is 1. Compartments to Log List The list of decorator compartments to log. See here for more details. File Delimeter String The character(s) to use to separate entries in the log. Default is a single comma ',' for CSV. Log Run Parameters Boolean Whether to write a file containing the parameters used to initialize the simulation. Default is "Yes". Log Writer Buffer Size Integer The number of bytes to write before flushing the log file buffer. Increased this number for better performance. Default is 1024 bytes. Image Width Integer The image width in pixels of the image created by the logger. Default is 1000 pixels. Image Height Integer The image height in pixels of the image created by the logger. Default is 500 pixels. Force Aspect Ratio Boolean Whether the image's proportions should match those of the objects being written. If yes, the width or height of the image may be changed proportionally to prevent skewing. Default is "Yes". Fit Canvas to Polygons Boolean Whether the canvas's bounds should be fit to the objects drawn or the projection. If Yes, then the canvas boundary is the bounding box of the objects being drawn. If No, then the canvas boundary is bounding box of the projection (useful for "whole Earth" views, such as creating a Google Maps overlay). Default is "Yes". Origin Latitude* Number Required only for origin-dependent map projections. The latitude of the principal Y axis of the projection. Default is 0.0. Origin Longitude* Number Required only for origin-dependent map projections. The latitude of the principal X axis of the projection. Default is 0.0. Use Logarithmic Scaling Boolean Whether to scale compartment values logarithmically when determining polygon color. Default is "Yes". Gain Number Multiplier to apply to compartment values when determining polygon color. Default is 1.0. Use Transparent Background Boolean Whether to make the background transparent or not. If no, the image background is determined by the color provider. Default is "No". Color Provider Class The STEM Color Provider to when determining the polygon fill color. Map View Boolean Whether the logger should try to automatically open the STEM Map View. 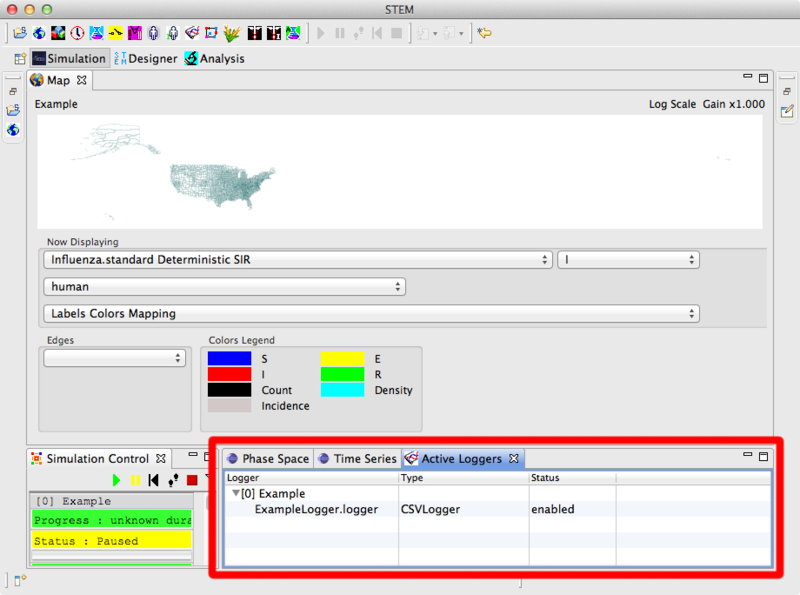 If the STEM Map View is not open, the logger will write a blank image. Default is "Yes".